The gear box ratios found on the Type R are shorter than those found on the standard STi (which themselves are lower than the UK model). 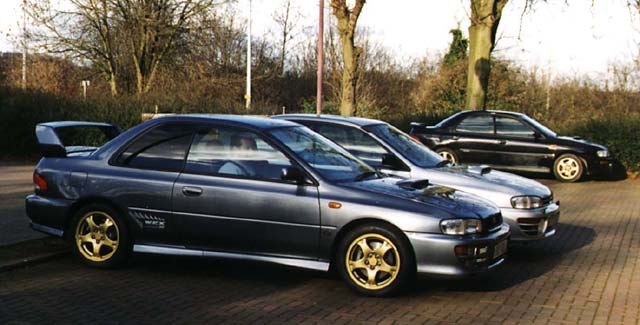 These gear ratios have been changed over the years and the first Type R introduced in 1997 had ratios a lot shorter than the ones found on the MY2000 model. For the MY97 4th is 106mph at the 7900rpm red line, whilst 5th is 146mph (sounds high enough but 5th in the Type R is actually shorter than 4th in the UK/export model). 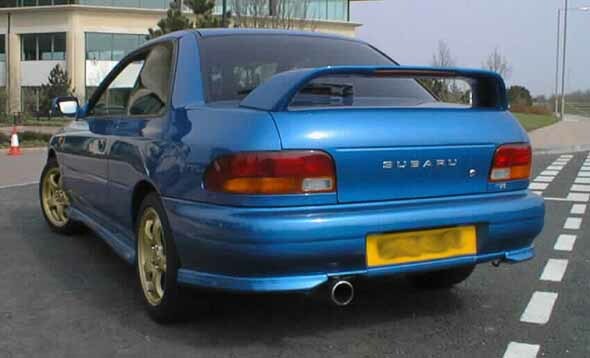 The Type R introduced in MY97 format, was the first STi model to get the high rear spoiler and colour coded side skirts. 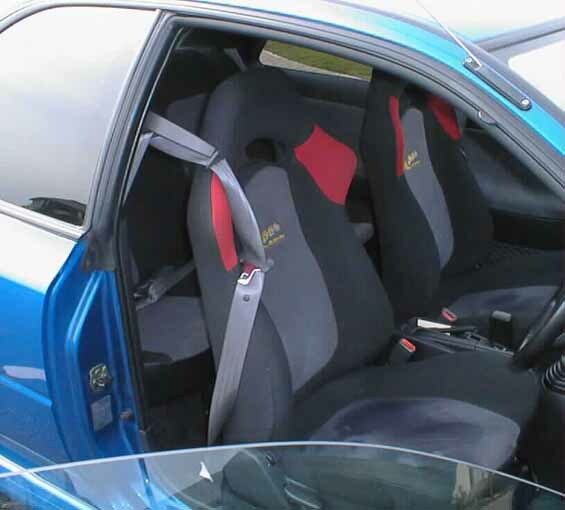 These were not introduced on the 4 door STi until MY98. The adjustable centre differential is one of the toys upon the Type R which makes the car desirable amongst Impreza owners. The way it works is by an electronic clutch which engages fluid filled clutch plates and this acts unlike a limited slip differential and more like a mechanical device. In the open condition the Type R handles very like a rear wheel drive car. The differential transfers the torque front and back equally but when one end loses grip (usually the lighter rear end) all of the torque is transferred to the axle that is wheel spinning. An LSD would keep some torque going to the wheels still with grip. Thus the Type R can bite the unwary. Moving the centre console switch one notch forward progressively locks the differential, and in the fully forward position the differention is completely locked. So why should you not have the diff. locked all the time? You are in effect forcing the drive on the front axle to be exactly the same as the rear. When going round a corner the wheels all rotate at different rates, the ones on the inside slower than the ones on the outside of the circular path. The front turning wheels travel at different rates to those on the rear fixed axle. Driving a Type R with the differential in the locked position on a good grippy surface will cause transmission damage, and the effects can be felt through the steering even when the diff. switch is set only one position forward. So when should you move the switch? As stated the rear of the Type R can be very lively if you let it get away from you. On damp and wet roads this is more likely to happen, so transferring some of the torque forwards might be advisable. With the slippery conditions the speed difference of the wheels will be compensated for by the overall slip on the road surface. If the surface is gravel or snow then it is safe to move the diff. 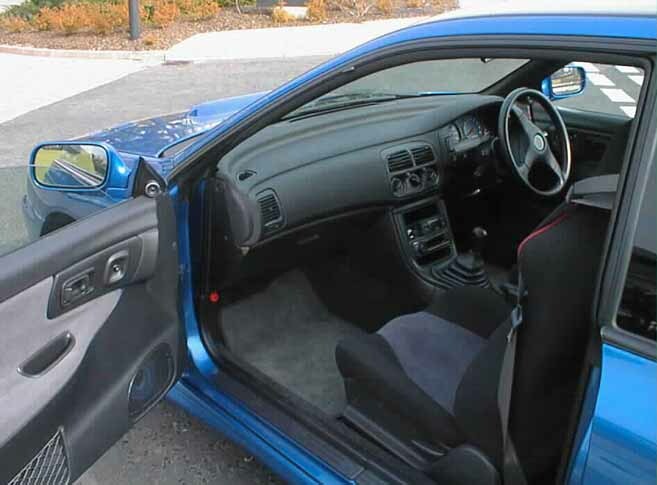 lock to fully closed, giving exceptional traction from both front and back, something an LSD would never be able to give. 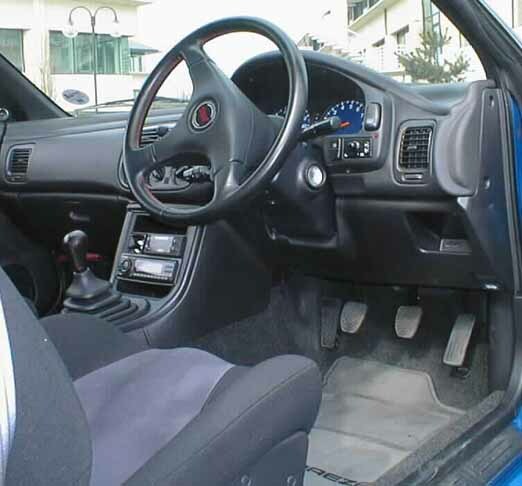 The effect of all of this is that some people find the Type R and adjustable differential a bit of a handful on the limit and as a result can not get the most out of the car. Great for the likes of McRae and Burns but not so great for your average driver. A side issue is that ABS would be difficult/impossible to implement with the differential and so the Type R misses out on anti lock brakes too. The space where the anti-lock servo would occupy in the engine bay is taken up by the water reservoir for an intercooler spray. During hard acceleration the ECU triggers the water pump and a fine mist of water is sprayed into the air stream over the intercooler cooling fins, reducing the temperature of the unit and thus the air passing through it. There is also a manual button on the dash board to play with to activate the spray. 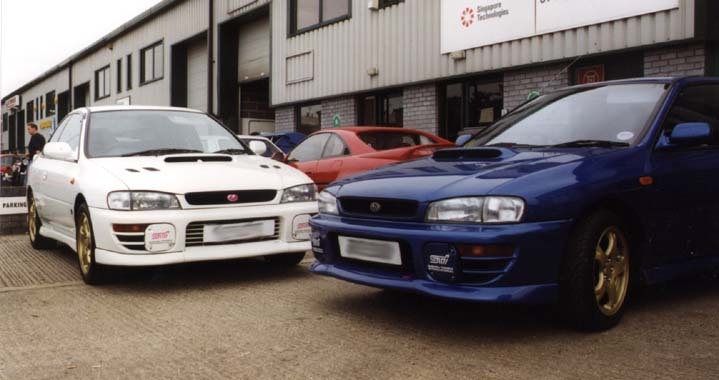 The type RA is along similar lines to the type R but is 4 door and goes even further and misses out a few more bits and pieces to make it ready for conversion into the ultimate rally car. No underseal, rear wing, radio-cassette, electric windows, cheaper seats and loss of sound deadening materials from the cabin. 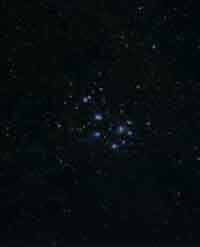 Before 1997 the engine was also a lot stronger than the other models due to being closed deck sand cast (i.e. individually cast rather than die cast) and can take much more modification. This is the engine of choice for the serious tuners and also includes an extra injector! 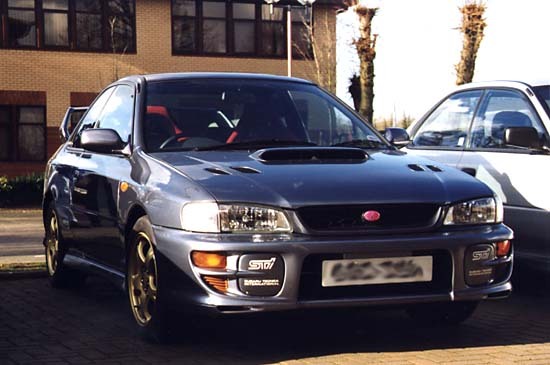 Strangely up until recently it was only 260PS (256bhp) but this is because most standard STi items would be thrown away in any upgrade. 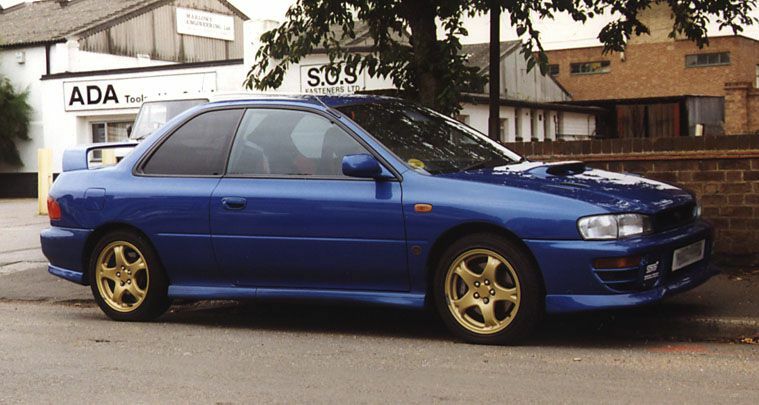 Before 1997 this was the vehicle used as the donor vehicle for the Group N and Group A rally cars. 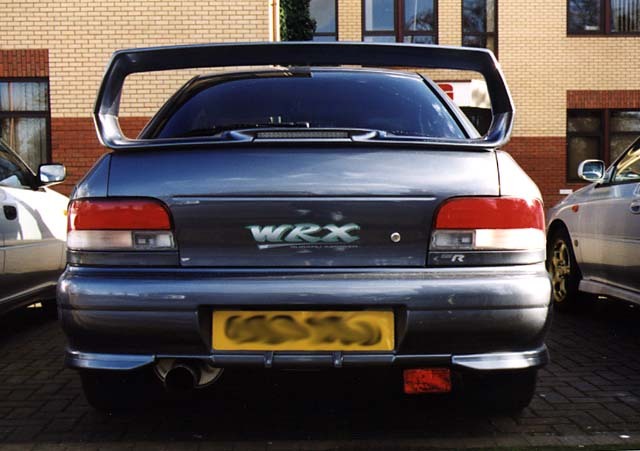 It is interesting to note that Prodrive switched from using this verhicle and went over to use the 2 door for both Group N and WRC cars up until the introduction of the New Age car. 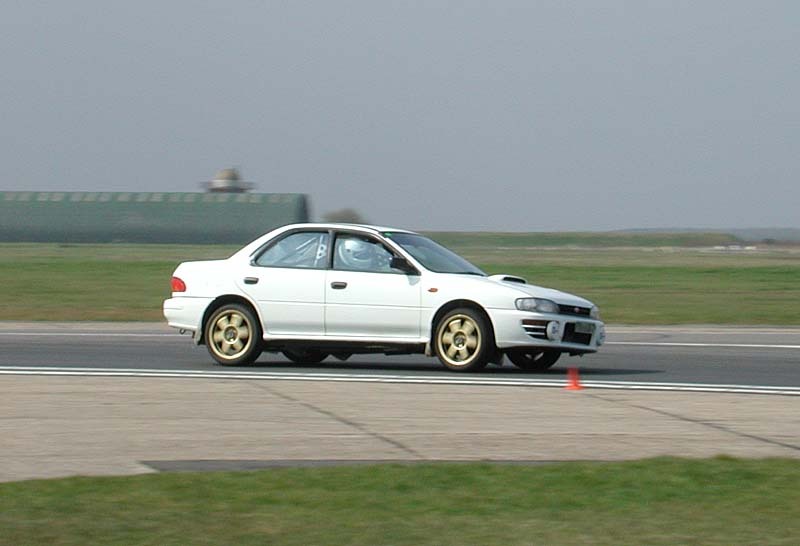 A modified RA at an SIDC drivers development day at Bedford Autodrome. 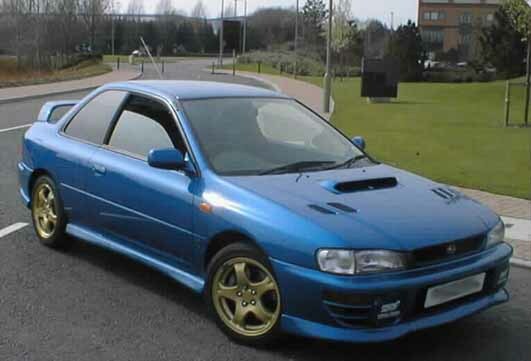 The WRX RA STi is an RA with the higher output STi engine with water spray and a better interior.